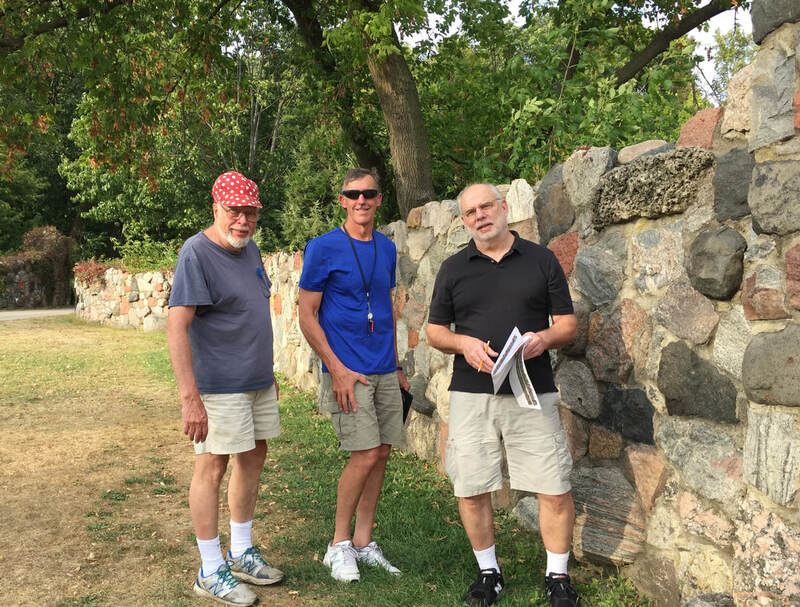 Built of glacial erratics the fieldstone wall at the entrance to Picnic Point provides visitors, students and others an opportunity to learn about Wisconsin’s geology. 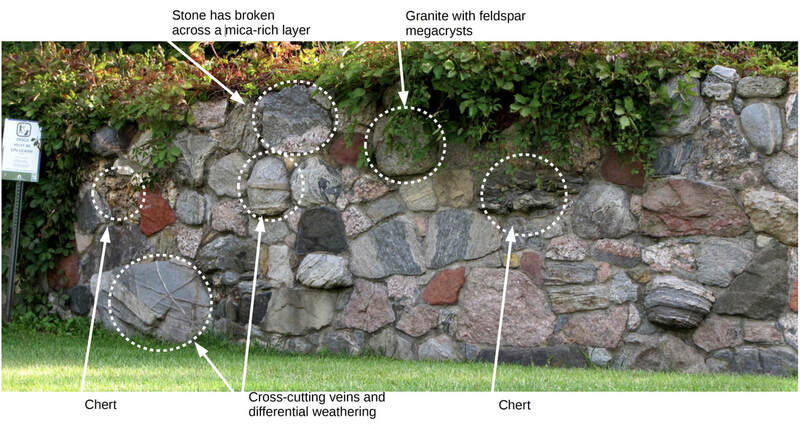 This key identifies the types of rocks and minerals visible in the roadside face of the wall, and discusses how these fieldstones came to be found in Dane County. In 1925 Edward J. Young purchased the 110 acre R.J. Stevens farm which included Picnic Point. The fieldstone wall and entrance gate were built along University Bay Drive sometime in the late 1920’s. According to Alice (Mrs.) Young, the rocks used to build the wall were hand picked from farm fields in the vicinity of Cross Plains. 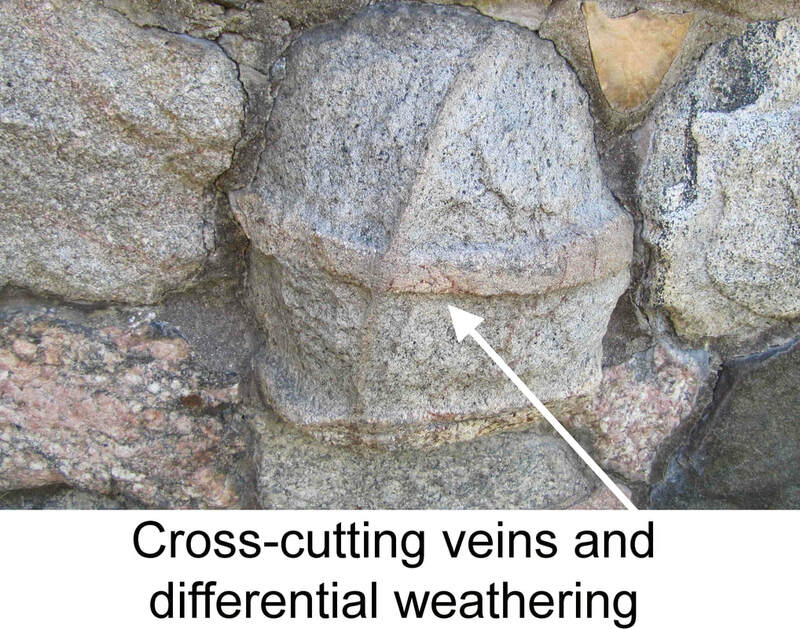 It is our good fortune that the masons who built the wall split the stones to create a flat roadside face, thus revealing the rock’s interior characteristics. Fieldstones are still a common feature in many parts of rural Wisconsin, but less so near cities and towns where they have been gathered and used as building material. 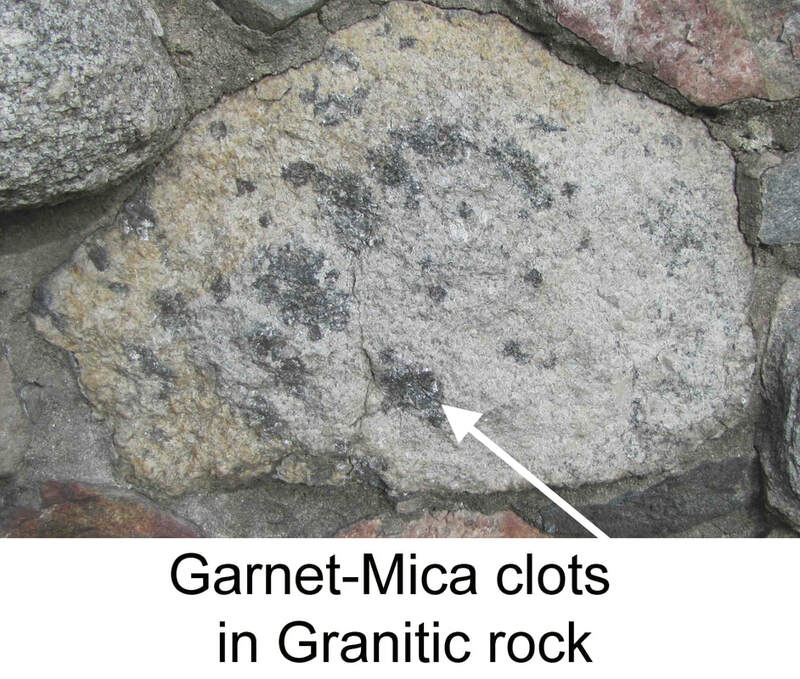 That many fieldstones did not come from the bedrock in the location where they were found (i.e. were “erratic”) led geologist Louis Agassiz in 1840 to deduce that they had been carried from far afield by glaciers. Once rough pieces of igneous, metamorphic or sedimentary bedrock, the erratics were shaped by weathering and the erosive forces of ice and water into more rounded rocks. Since the late 1800’s, geologists from the University of Wisconsin and others have worked to understand how glaciers have affected Wisconsin’s landscape, providing insights about where these stones may have come from. Between 29,00 and 18,000 years ago a glacier (the Green Bay Lobe of the Laurentide Ice Sheet) scoured the landscape of Dane County. 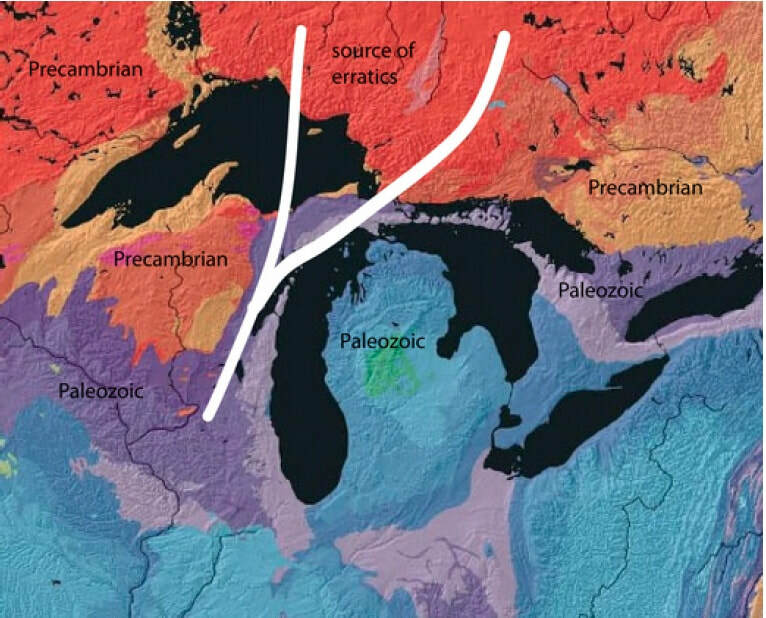 Originating in what is now Ontario Canada, the Green Bay Lobe picked up pieces of bedrock from along its path and carried an assortment of them into Dane County where they were deposited as the glacier melted and withdrew. The white lines in the figure at left show the likely sources of the erratics as they were carried southward by the glacier. 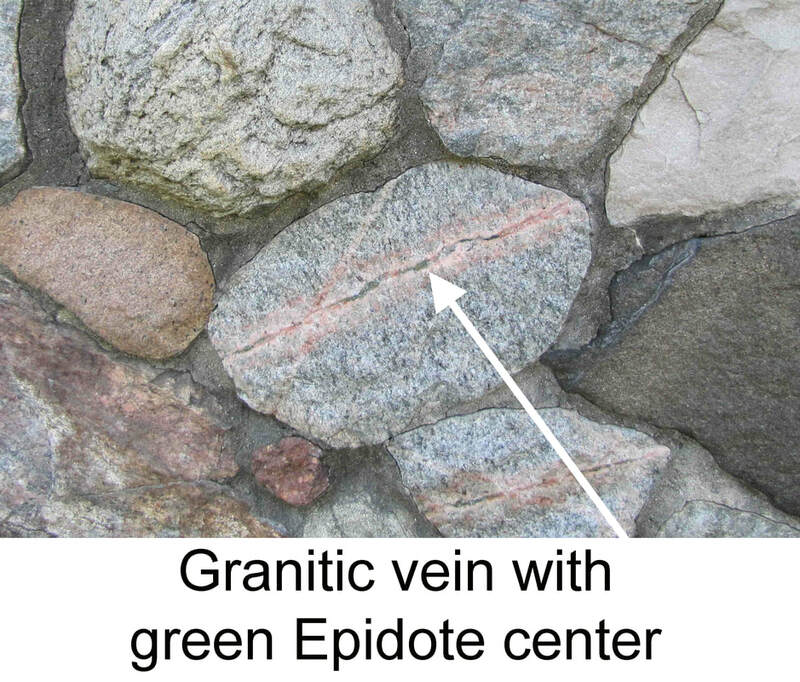 As the glacier edge began to retreat from Dane County about 18,000 years ago, the erratics that had accumulated on and at at the front of the ice sheet were deposited near its leading edge in a terminal moraine. In Dane County this outermost moraine, the Johnstown Moraine, runs from Brooklyn in the south through Verona and Cross Plains and to near Prairie du Sac in the north. As the ice sheet withdrew, erratics of all sizes lay across the landscape and many were cleared from farm fields and used for building. The panorama of the east arm of the wall indicates the location of the section photos that follow. 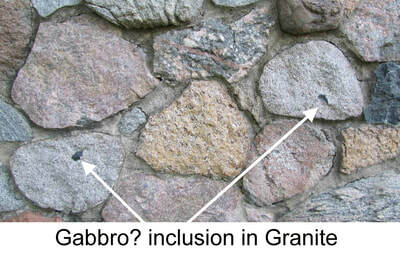 Use distinctive specimens or patterns of stones to help identify where the sections end and begin. Examples of the types of rock and rocks with interesting features are circled and labeled. 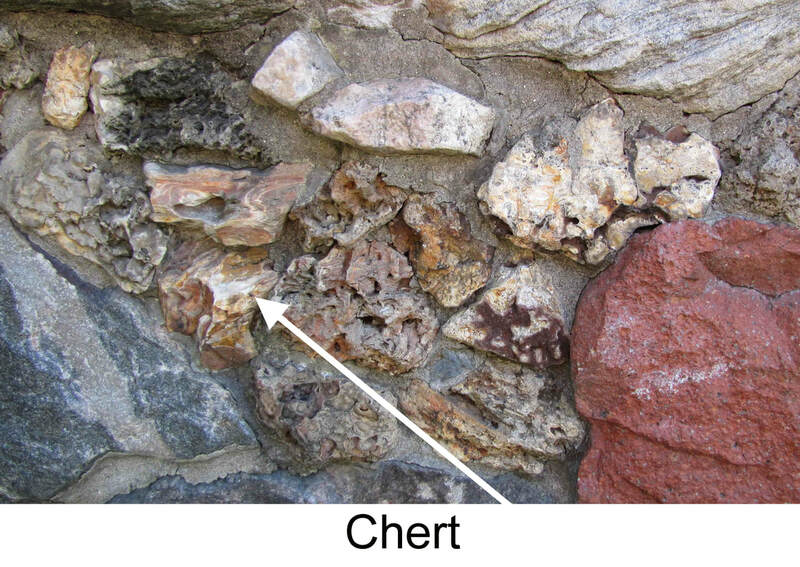 Following each of the five wall sections are detailed pictures of some of the more interesting rocks. 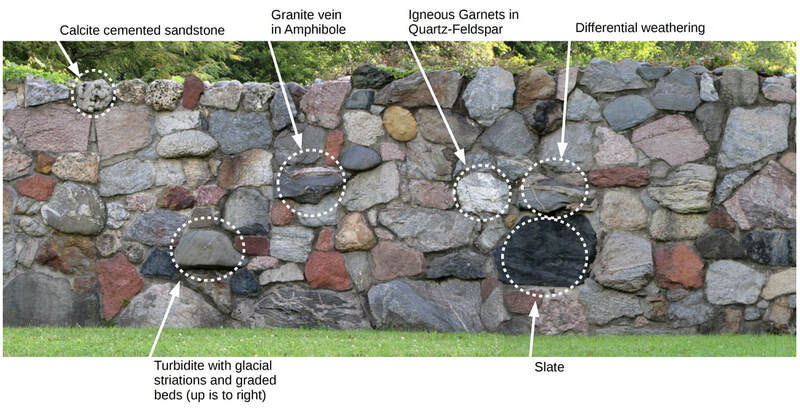 A glossary of geological and mineralogical terminology briefly explains the characteristics of the rocks, with links to the Wisconsin Geological and Natural History Survey – Minerals of Wisconsin database. Rocks and minerals solidified from molten magma. Light colored, coarsely crystalline, silica-rich with a wide variety of colors and textures. 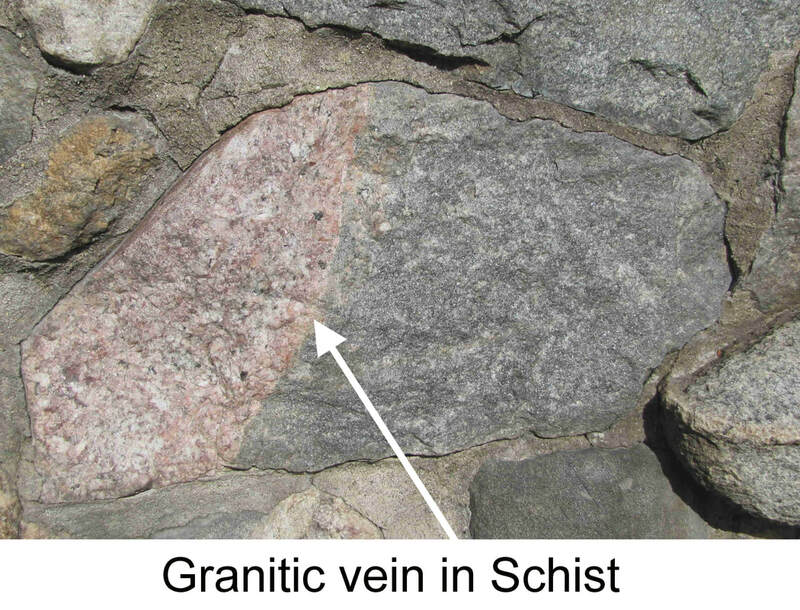 A common igneous rock in the continental crust. ​Rock formed from the consolidation of layered sediments, fragments of other rocks, plant and animal residues or chemical precipitation. ​Rocks that have been modified from their original type (igneous or sedimentary) by heat, pressure, and fluids deep in the Earth’s crust. 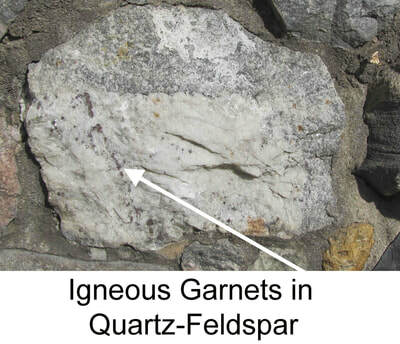 ​Formed from igneous rock (e.g. basalt), typically dark and coarse textured. 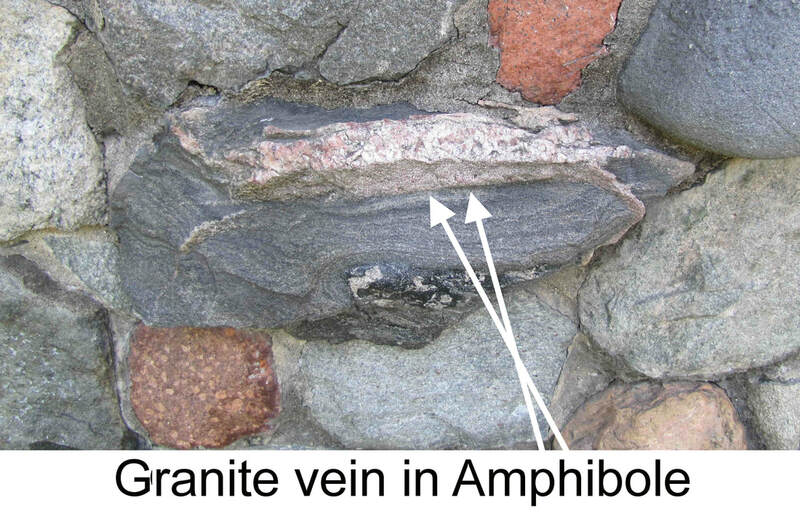 ​Formed from both igneous and sedimentary parent rock. 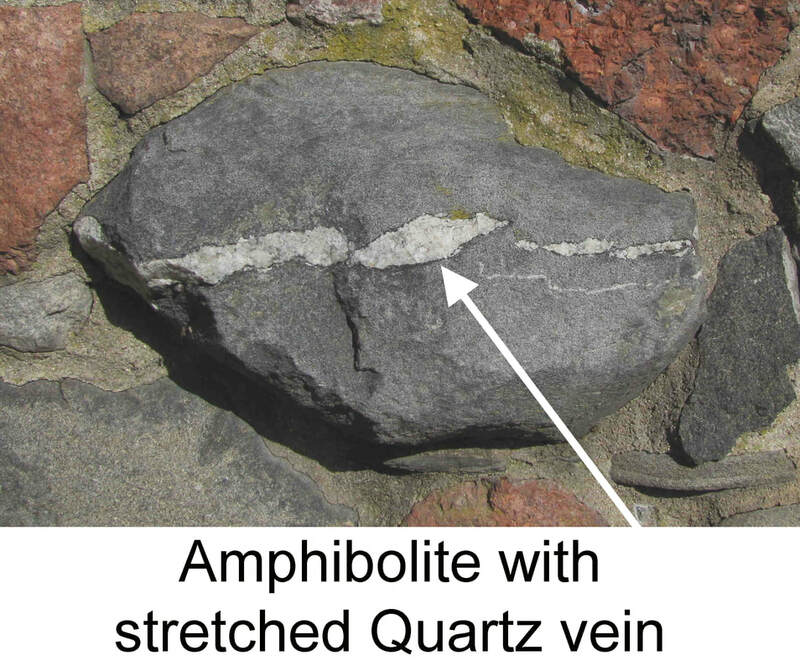 Characterized by coarse-grained layers composed of different minerals that may be folded. 2500-3000 Ma. 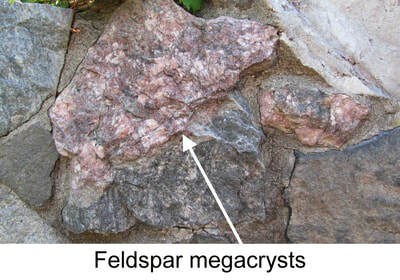 Hard, quartz-rich rock (originally sandstone) fused with silica by heat and pressure.Commonly white-gray to red-purple. 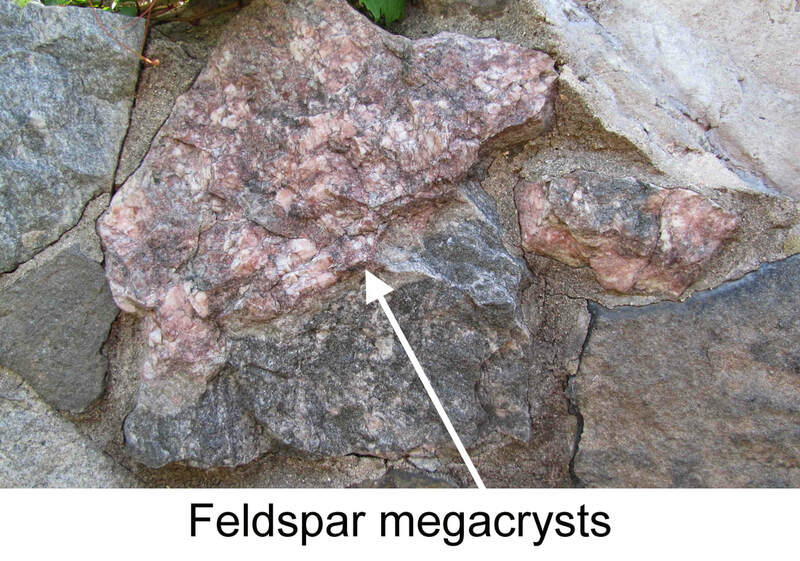 Formed from a variety of source rocks and minerals. 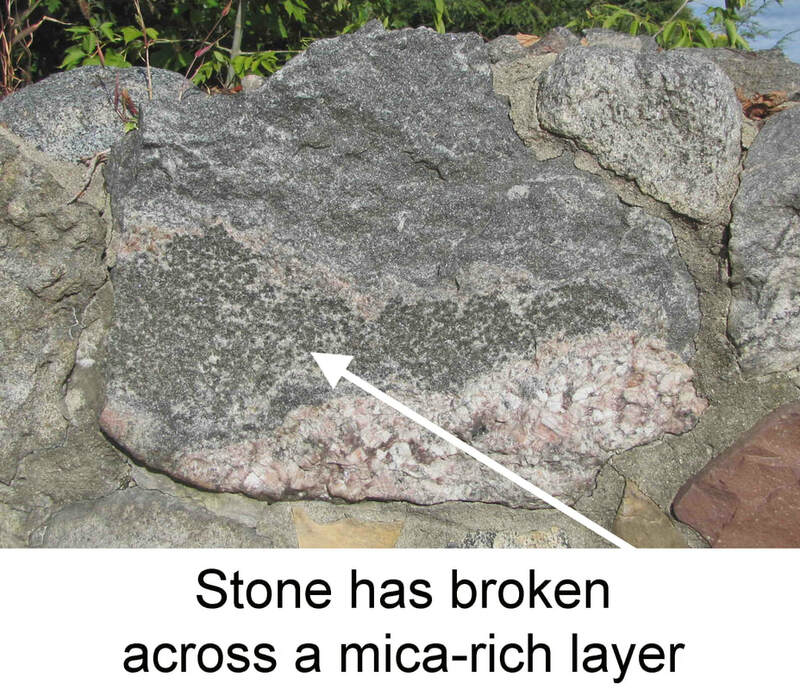 Coarse-grained with visible crystals and easily split especially along mica-rich layers. Natural inorganic elements and compounds as crystals formed by geologic/geochemical processes. Most rocks are composed of minerals. A group of closely related rock-forming silicate minerals such as Hornblende. Calcium-magnesium carbonate (CaMg(CO3)2), usually translucent white. A light to dark green silicate mineral that can form hydrothermally in metamorphic or igneous rocks. A group of silicate minerals. Hard, brittle, lustrous and transparent, commonly red. A group of silicate minerals that split cleanly yielding sheets or plates. Lustrous and transparent to black. One crystalline form of SiO2, clear to milky, white to black and very hard. 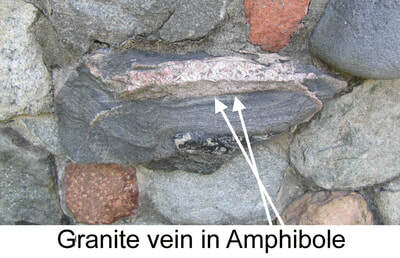 found in magmas and igneous rocks (e.g. silica-rich). ​Veins that intersect one another can be used to determine relative ages of vein filling events. 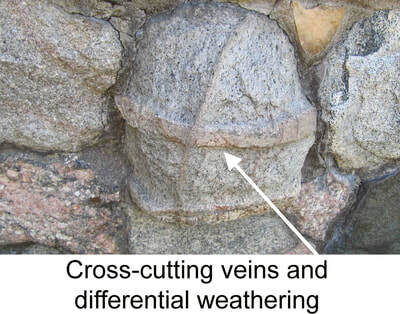 May be accentuated by differential weathering. 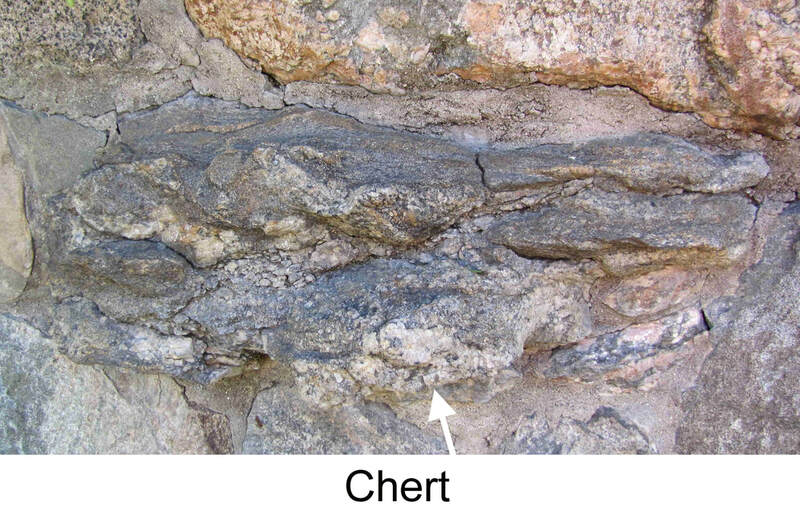 Formations superimposed on the host rock, cemented by silica, carbonate or iron oxides that resist weathering, thus revealing odd shapes and textures as the surrounding softer material is weathered away. Removal by physical or chemical processes of components of a rock by preference to their hardness or chemical reactivity, resulting in an uneven surface. 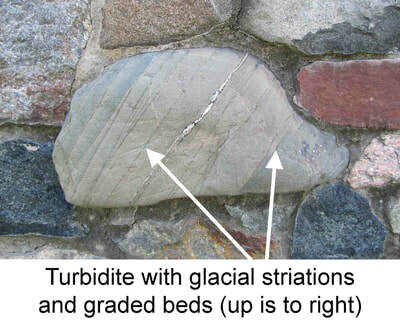 Scratches or other marks created on either bedrock or stones by the forces of moving ice sheets. In bedrock outcrops these striations indicate the direction of ice movement. A layer of sedimentary rock (e.g. 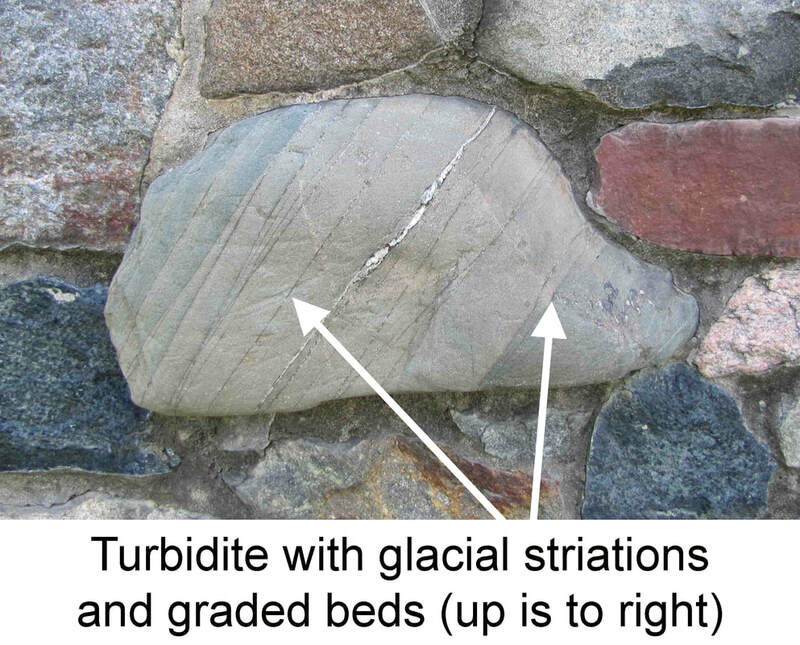 turbidite) where the particle size in a layer ranges from coarse at the base to fine at the top of each layer (bed). A fragment of an older rock incorporated in an igneous rock. ​The texture of igneous rocks that have larger crystals surrounded by tiny crystals (or even glass). 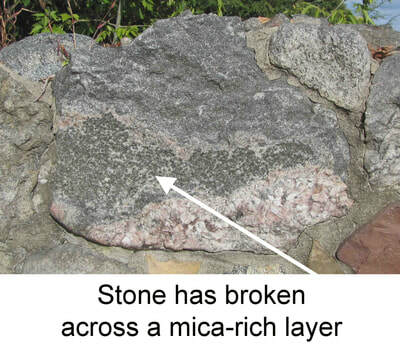 Rock that has been altered by increasing the amount of silica (and consequently increasing the hardness). 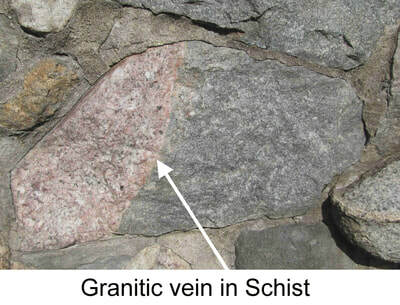 A fracture in rock that subsequently fills with one or more other mineral(s).